Ammon and Rachel Underwood House – SAVED! The Ammon Underwood House is a contributing property in the East Columbia Historic District, listed on the National Register of Historic Places. The original portion of the house was built about 1835, and significantly expanded in 1838. Constructed on the banks of the Brazos River, it was listed as endangered because of continuing erosion of the riverbank. The house was saved when it was relocated 300 yards away and out of the path of the river. It is a museum today. A 2-story frame dwelling with center-passage plan, the Ammon Underwood House is a modest vernacular interpretation of the Greek Revival style typical of the type built in Texas during the middle decades of the 19th century. Facing northwest onto Main Street, the dwelling is sheathed with wood siding and surmounted by side-gabled roof featuring composition shingles. An inset 2-tiered porch of 5 bays extends across the full width of the primary elevation. Detailed with square posts with molded caps, it features a balustrade on the second level. Fenestration includes single-door entrances with sidelights and transoms and double-hung wood sash with 6/6 lights on both levels. The Sweeny-Waddy House, relocated to [the] rear of the property for use as a museum facility in the 1970s, is classified as a Noncontributing element of the district. [The house] is best known as the 50-year residence of Texas pioneer Ammon Underwood. Built in 1835 by Thomas W. Nibbs, a lawyer from Alabama, the house originally was a two-room frame dwelling. 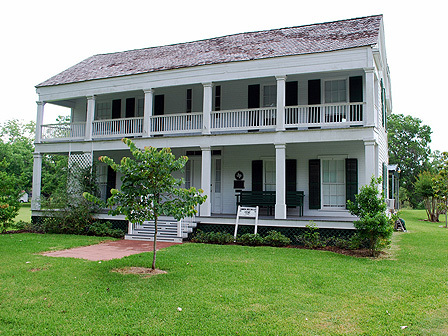 An unsuccessful law practice caused Nibbs to move to Fort Bend County to start a plantation in 1838, whereupon he sold the house to Ammon Underwood.